Since writing that last post, I had a bee in my bonnet about replacing the Tyme Sefari + A Sound Of Thunder, and spent the weekend researching the alternatives. Long story short: I have decided to keep the Tyme Sefari. Sure it’s lo-fi, but I had occasionally thought about getting a Doepfer BBD (analog bucket-brigade delay) precisely because it is lo-fi, in kind of a similar-ish way. Durrr… anyway, running Tyme Sefari’s main output through a filter and turning it down a bit dark actually sounds really lovely. And I like the logic of how Tyme Sefari works, which is unique. Only one other module I’ve found can do everything it can — SDS Reflex Liveloop — but that one works through a bunch of different modes instead of a unified, fluid design. I’ll probably ditch the A Sound Of Thunder expander though. The only feature on it I really like is the slightly awkward extra channel for stereo, and I can let go of that. Most of my hardware stuff runs in mono channels anyway, or else mid/side encoding. Mono (monoaural) vs. stereo is probably familiar — either one audio channel, or two related channels. Stereo typically uses “LR” encoding — left and right, predictably enough. “MS” or mid/side stereo, instead treats one channel as the middle of the sound field, and the other as the differences that happen on the edges. Mid/side is not very intuitive to think about, but it’s pretty simple to convert from LR. Just add the two channels together to get the mid signal, and subtract them from each other to get the side signal. Some attenuation might be needed to avoid distortion if the inputs are already loud. With mid/side encoding, you can’t make distinct left/right movements — But it’s very handy for getting a balanced yet wide and dramatic sound by processing the mid and side differently or even using different sources, and I like working with it especially in modular. 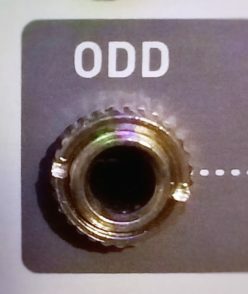 There are a couple of mid/side encoder modules available, but I usually do the conversion with a plugin. With that wrapped up, it’s time to look at the top row of the Mantis! At left is the second half of the Doepfer A-180-9 Multicore mentioned previously. Plugged into the top are the stereo outputs from one of my FX pedals, sent onward to my audio interface without really being processed by any of my modular gear. The next module, with the amber-on-black screen, is Monome Teletype. This module lets you write short snippets of code with a computer keyboard (wireless in my case) which run whenever triggers are received or its internal metronome ticks. It has a single CV input, and can output gates/triggers and control voltages — so you can use it to manipulate gates, play stored sequences or generate them algorithmically, record CVs as a new sequence, generate envelopes or LFOs, and so on. It’s extremely flexible, it just requires thinking a bit like a programmer — which I am. Mine’s mounted upside-down with a firmware-flipped display, to keep the jacks out of the way of the screen. 5/5. Algorithmic sequencing or algorithmic composition is the practice of using some relatively simple math and logic to determine rhythms and/or pitches, rather than explicitly composing them. Algorithms may include some stored patterns, but these are the basis of further logical or mathematical operations. Generative patches are those where the interaction of electronic circuits drives the music. The Krell patch is an iconic example. Sometimes the lines between the two are blurred or erased, with digital algorithms feeding analog processors and vice versa. Circuit Abbey G8 is on its right. It’s a clock divider or clock distributor, which is something Teletype can do very easily. But unlike the Teletype, it runs fast enough to send audio through it and get back squarewave audio in lower octaves. Sometimes I keep the Teletype busy with other things anyway. It’s useful enough to justify keeping it around. 4/5. And then there’s Noise Engineering Mimetic Digitalis. It’s a 4-channel sequencer laid out on a 4×4 grid, which can be navigated via triggers or CV in two dimensions or linearly or randomly, all at the same time. I really like this one in theory; the problem is I don’t often find myself using it that much in practice. I can imitate most of its behavior in Teletype and in another module later in this row. I still feel like I should give it more of a chance, though. 3/5. Next, with some cables plugged in and sent overhead, is ALM Busy Circuits S.B.G It attenuates an audio signal from Eurorack levels down to the levels expected by guitar FX pedals, and raises a pedal-level signal back to Eurorack levels. It offers a dry/wet knob, and a further converter from Eurorack CV to 3V or 5V “expression pedal” inputs for FX pedals. It does the job, though I feel like the knob response/ranges are a little odd and the layout could have been friendlier (I should at least turn it upside-down). 4/5. Dry/wet or simply “mix” is a common control on FX. The “dry” signal is the input of any FX unit or chain, while its output is “wet.” Blending them is a nice way to avoid overwhelming your audio with too much of a good thing, e.g. reverb. So slim you might miss it, 2hp Trim is next. It’s a dual passive attenuator. Along with the S.B.G I’m using it to lower Eurorack signals to guitar FX levels, since I’ve got a few FX I want to use separately. It’s actually not calibrated for this purpose, with the right range being somewhere in the lowest 1/10 or so of the knob. 2/5. To its right is Circuit Abbey Gozinta. It’s an amplifier to give a clean boost to, you guessed it, signals coming in from FX pedals. Or any other source where the voltage might be lower than you want, or where you want to overdrive a signal to distort it. It does its job admirably. 4.5/5. The wide module after that is Pittsburgh Lifeforms Double Helix. It’s got a West Coast vibe overall, with a pair of oscillators, an LFO, a wavefolder, an LPG, and a dual modulation bus that makes it easy to assign things to modulate other things. It’s also haunted by crosstalk and weird interactions within the module, which can annoy or please in equal measure. The oscillators are kind of “chewy” and well suited to the character of the folder and LPG (which is a simplified Dynamic Impulse Filter). It sounds great, and whenever I consider dropping it, its unique character grabs me and changes my mind. 4/5. Next, with the big knob backlit in blue-green, is a DIY build (by someone else) of Mutable Instruments Warps. The general idea behind this one is it combines and mangles two audio signals in various ways — though it also has its own VCO which does rather nice phase modulation. I sold my first one, and months later, traded for this because I missed it. I don’t actually use it a lot, but it’s occasionally welcome. 3.5/5. Mutable Instruments is one of the popular Eurorack module brands. Its founder started with open-source, DIY desktop synths and chose to continue using that model upon entering the Eurorack market. This has its pros and cons; parts of Mutable Instruments code live on in many other open-source projects and people have made alternate firmware to add new functions to the modules. People have also independently done DIY builds of the modules, or smaller redesigned versions, for themselves or others. The black module with the blue display is uO_C, or micro Ornament & Crime. This is part of an open-source hardware and software project, which is itself partly based on Mutable Instruments code. I have Hemisphere Suite installed on mine, which is a set of dozens of utility apps, ranging from envelope generators to Euclidean generators to quantizers to quixotic sequencers. There’s almost always something useful for it to do. 4.5/5. The narrower black module to its right is Erica Synths Pico A Logic. Given two inputs, it returns the sum, difference, maximum and minimum voltages. Hemisphere Suite can do that too, but this is better suited to audio signals since it’s not limited by rate. I don’t use it a lot, but it fills an awkwardly small space for which I don’t have a better use at the moment. 3.5/5. The neighbor with the red buttons is Ladik P-075 Dual Switch. It’s a simple, passive module where you can connect or disconnect any signal via a manual toggle switch and button combination. The button inverts the state of the switch, which is clever. It’s handy to run constant voltages through just to use as a gate source, or to mute parts of a patch. 4/5. The wood panel on the right side end is a Bastl Dynamo. It’s a busy module, where the top part combines an envelope follower, comparator and some inverters and rectifiers to create a control source for a VCA for compression — lowering the level when it gets too high. Of course it can be patched in other ways as well. The bottom section is an inverter and a very fast A/B switch, and I don’t fully understand the intention of including it rather than a VCA, but it can do some cool stuff once in a while. Again, I don’t like the wood panel and was supposed to have received an aluminum one. 3.5/5. One more row to cover, plus some FX and mentions of favorite software and maybe a couple other things! While writing this post, I started patching up a generative piece using two LFOs ANDed and XORed together, inverted, fed to the G8… all those gates clocked Mimetic Digitalis, some envelope generation, delay syncing and so on. By the time I finished it was quite a busy patch, the kind that uses up most of my cables. If I still think well enough of it tomorrow, I’ll be submitting it to the Ambient Online Fire compilation.